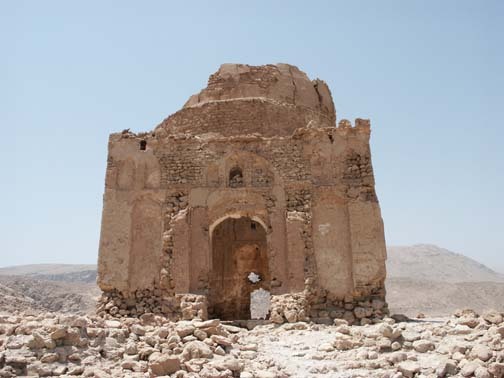 This Mausoleum was built for Baha al-Din Ayaz, successor Mahmud b. Ahmad al-Qusi al-Qalhati the founder of the Hormuz empire which flourished in the 8th/14th century. The mausoluem was built by the wife of Baha al-Din, Maryam, and is thus call the Bibi Maryam mausoleum. 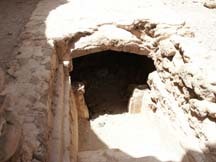 It is located on the Omani coast south of Muscat near the medieval city of Qalhat. The city was described by Marco Polo and visited by Ibn Battuta in the second quarter of the fourteenth century. Ibn Battuta describes a Congregational Mosque in Qalhat which some scholars think he confused with the Bibi Maryam mausoleum. Even today, visitors to this mausoleum light candles and leave offerings for Baha al-Din and his wife Maryam although the visitation of tombs does not ordinarily play an important role in Ibadi practices.